The illumination of the Northern Lights occurs when charged solar particles collide with atoms and molecules in the Earth’s atmosphere. Green bursts of light are most commonly witnessed; these are collisions with oxygen atoms 100-200km above the surface of the Earth. Blue colours are collisions with nitrogen atoms at the same distance, whilst oxygen atoms glow red when excited by the solar particles. Our seven night itinerary combines Tromso, considered one of the best places in the world to see the natural phenomenon of the Aurora Borealis; the Swedish mountain resort of Bjorkliden and the world-famous ICEHOTEL in Jukkasjarvi, all destinations are above the Arctic Circle and situated under the Aurora oval. On arrival at Tromso airport, you will be transferred to Clarion Hotel The Edge. Overnight at the Clarion Hotel The Edge, Tromso. This morning, we have included a husky dog-sled adventure. Our chosen dog sled provider offers intimate, small group tours and, in our opinion, the highest standard of dog-sled excursions in the area. All guests have the opportunity to try their hand at mushing their own team of husky-dog sled. In the evening, depart Tromso on a 6-hour Aurora hunt. This small group tour will take you in search of the Lady Aurora and will travel to whichever location is deemed to have the best atmospheric conditions for a sighting. You may stay close to Tromso, drive along the Norwegian coastline or head inland towards the Finnish border. Hopefully, if conditions permit, your journey will be illuminated by the dazzling Aurora swirls overhead. After breakfast, depart Tromso by bus and travel to the harbour town of Narvik (c. 4 hours). Self-transfer to the Scandic Narvik. Overnight at the Scandic Narvik, Narvik. Today continue by train to the Bjorkliden Mountain Resort on the outskirts of the Abisko National Park (c.2 hours). Self-transfer from Bjorkliden train station to the Bjorkliden Mountain Resort (c.10-minutes walk). Overnight at the Bjorkliden Mountain Resort, Swedish Lapland. Day at leisure in Bjorkliden. Opportunity to participate in a snowmobile tour, snow shoe tour and to visit an ice cave. Alternatively, there are 19 ski runs and 24 km of cross-country ski trails to try. In the evening, participate in an Aurora photo tour in the Abisko National Park. Due to its high percentage of clear night skies and virtually no light pollution Abisko is one of the greatest places in the world to see the Northern Lights. Under the supervision of a professional photographer you will have a high chance of going home with beautiful Aurora photographs and memories that will last a lifetime. After breakfast, transfer to Jukkasjarvi and the location of the original ICEHOTEL (c.90 minutes drive). This evening, before settling down to sleep in your ornately decorated Art Suite, you will enjoy a snowmobile tour in search of the Northern Lights. Exploring the wilderness areas surrounding the frozen River Torne and away from artificial light pollution, there is a good chance of a sighting should conditions permit. An evening meal is included as part of the tour. Overnight at the ICEHOTEL, Swedish Lapland. Day at leisure in Jukkasjarvi. Opportunity to participate in a dog sled tour, reindeer sled excursion or to try your hand at ice sculpting or cross-country skiing. Tonight, your accommodation will be in the comfortable warm accommodation at the ICEHOTEL. After breakfast, transfer to Kiruna airport for your return flight to the UK. 200km north of the Arctic Circle, Narvik, the best location for alpine skiing in Norway, is 1,561 km north of Oslo. The award winning Scandic Hotel, is housed in a 19 storey building which dominates this small town. It is northern Norway’s highest building. 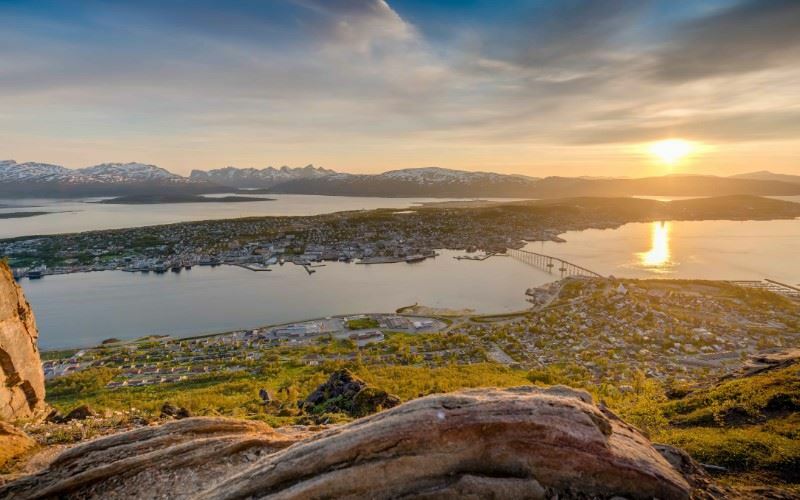 Built in 2012, the hotel affords panoramic views over Narvik and the Ofotfjord and the surrounding mountains. The view is particularly stunning from the hotel’s Skybar on the 15th floor. In fact, given the right conditions, you can view the Aurora Borealis from your bedroom and marvel at the Midnight Sun. The decor is typically Scandinavian and is a reflection of the terrain surrounding the town. ‘Tind’ restaurant serving breakfast and an exclusive dinner menu. Sky bar ‘Tøtta Bar’ with a panoramic view over Narvik and Ofotfjorden. Complimentary WiFi in public areas and rooms. The resort of Bjorkliden is located 2km west of the Abisko National Park, 500m above sea level and with excellent panoramic views over the surrounding mountain ranges and of the natural landmark ‘Lapporten’ – a gateway in the mountains. This is a destination for Aurora hunters, family holidays, downhill and cross-country skiing and for winter activities (snowmobiling, dog-sledding, snowshoe hikes, caving and visits to the Aurora Sky Station). The resort of Bjorkliden is located 2km west of the Abisko National Park, 500m above sea level and with excellent panoramic views over the surrounding mountain ranges and of the natural landmark 'Lapporten’ – a gateway in the mountains. This is a destination for Aurora hunters, family holidays, downhill and cross-country skiing and for winter activities (snowmobiling, dog-sledding, snowshoe hikes, caving, ice fishing and visits to the Aurora Sky Station, ICEHOTEL and Narvik). During the early winter (December to February) the resort is quiet and relaxed. This is the time of year when the darkness of the polar night, the twinkling of stars and the Northern Lights take centre stage. Take advantage of the variety of daytime and evening excursions on offer to truly discover the highlights and history of the region, or just relax near the fire in the panoramic lounge. From the middle of February, the ski-slopes are open and the resort is livelier. Guests can be found exploring the snow-covered mountainsides, visiting the Laktatjakko mountain top cafe and enjoying the search of the Northern Lights. Bjorkliden Mountain Resort is an excellent choice for couples and families with a variety of accommodation to suit all requirements. Accommodation at Bjorkliden is divided between the main building and 83 detached cabins (80 two-bedroom cabins and 3 four-bedroom deluxe cabins) with ski-in/ski-out facilities. Restaurant Lapporten with views down the mountainside to Lake Tornetrask and a wood burning fireplace. The restaurant only accepts payment by credit card. Buffet breakfast (c.150SEK when not pre-booked), a set lunch menu (c.125SEK when not pre-booked) and a set evening menu or a la carte menu served (dependent on season). Sports shop where you can hire ski/activity equipment. 8-minutes by train to Abisko (8km). 1 hour 30-minutes by train from Kiruna. 1 hour 30-minutes by train from Narvik. 19 ski runs (graded green to black) and with five lifts, and 5 off-piste runs. The beginners slope will open at Christmas but the resort opens fully on 03Feb19. A complimentary shuttle service operates between Bjorkliden and Riksgransen (daily between 24Feb-06May19). Located in Jukkasjärvi, in the heart of the unspoiled wilderness of Swedish Lapland, stands the world famous and original ICEHOTEL. Located in Jukkasjärvi, in the heart of the unspoiled wilderness of Swedish Lapland, stands the world famous and original ICEHOTEL. For the last 28 years, each winter a unique and breathtaking sculpture has taken form on the banks of the River Torne; a structure where everything from the artwork, to the chairs you sit on, the beds you sleep on, and the glass in your hand has been made using carefully harvested, crystal clear ice from the neighbouring river. In November 2016, the ICEHOTEL launched a new 365 day concept, allowing guests to experience sleeping on ice all year round in a specially designed permanent building. During winter, the exterior looks similar to that of the original ICEHOTEL structure but in summer it has a grass covered roof adorned with Arctic mountain flowers and kept cool by several solar panels. A stay at this exquisite property is guaranteed to be one that you will never forget. These rooms are located within the original ICEHOTEL structure and the newer ICEHOTEL 365 building. The ICEHOTEL 2017-18 will house 20 Ice rooms and 15 Art suites. The ICEHOTEL 365 will house 11 Art suites 365 and 9 Deluxe suites. Approximately 25 artists and architects are commissioned each year to decorate and design the rooms, bar and gallery. Ice rooms: Rooms with special beds built of snow and ice and decorated with furniture made from ice. Some Ice rooms can accommodate 3 people and one room can accommodate 4 people. Art suites: Individually designed rooms with special beds built of snow and ice and decorated with furniture and unique artwork made from ice. All rooms have been designed and sculpted by international artists. Some Art suites can accommodate 3 people. Art suites 365: Similar to Winter suites, these rooms are individually designed with special beds built of snow and ice and decorated with furniture and unique artwork made from ice. All rooms have been designed and sculpted by international artists. Deluxe suites: Hilla, Jauvre and Johka are individually designed rooms with a special bed built of snow and ice and decorated with furniture and unique artwork made from ice. Hilla has an en-suite bathroom (shower and sauna), Jauvre has an en-suite bathroom (bath, shower and sauna) and Johka has an en-suite bathroom (shower). Beds are made out of snow and ice and insulated by a mattress and topped with reindeer skins. You will be provided with a subzero sleeping bag. All rooms in the original ICEHOTEL building have curtain doors whereas the ICEHOTEL 365 rooms have a solid door. Guests staying in the original ICEHOTEL have shared bathroom facilities (toilet, shower, changing rooms and lockers) in an annexe building. Guests staying in the Art suites (ICEHOTEL 365) have use of the shared heated washrooms (toilet, shower, changing rooms and lockers) in an annexe building but also have a toilet within the ICEHOTEL 365 building. Guests staying in the Deluxe suites (ICEHOTEL 365) have a private heated relaxation area with sauna and en-suite bathroom with shower. Sauna (free of charge for guest use). Luggage cannot be taken into the ICEHOTEL's cold accommodation structure. Secure storage is available. Inside the hotel the temperature is at a constant -5°C to -8°C. The ICEHOTEL is a museum during the day from 10am until 6pm. Overnight guests are allowed access to their room after 6pm and the wake-up call is around 7:30am. Cold accommodation is not recommended for children under 6 years. These rooms are located in the grounds of the ICEHOTEL. Kaamos Rooms: Decorated using a contemporary Scandinavian design these rooms have double or twin beds, bathroom (shower and hairdryer), TV, telephone, WIFI internet connection and kettle. Nordic Hotel Chalets: Decorated using a contemporary Scandinavian design, each Nordic hotel chalet has two bedrooms - one double/twin bedroom and one room with bunk beds - bathroom (shower and hairdryer) and a separate living room with TV, telephone, WIFI internet connection, kettle and fridge. Arctic Hotel Chalets: Decorated using a Scandinavian wood cabin design, each Arctic hotel chalet has two bedrooms – one double bedroom and one single bedroom - bathroom (shower and hairdryer) and a separate living room with TV, telephone, WIFI internet connection, kettle and fridge. Homestead restaurant serving an à la carte menu – approximately 800m from the ICEHOTEL overlooking the Torne River. Reservations are recommended. Table reservations available at 17:30 and 20:00. ICEBAR by ICEHOTEL. Please note that the ICEBAR closes at 6pm until December 2018. Open: The ICEHOTEL will open on 14 December 2018 to 10 April 2019. The ICEHOTEL 365 will accept guests year-round. Arrivals in November may be able to see the sculptors at work. Notes: Due to the unique nature of the original ICEHOTEL, it takes a different form each year. Opening and closing dates are very much dependent on the weather. The images shown, of the cold accommodation, are from structures over the years.